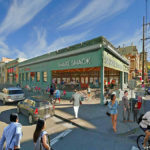 It was back in 2015 that San Francisco’s Board of Supervisors approved the City’s $18.5 million purchase of the corner parcel at 490 South Van Ness Avenue and 16th Street in the Mission, a site which was approved for the development of a seven-story, 72-unit building and which the Mayor’s Office of Housing and Community Development planned to have developed and offered at below market rates (i.e., BMR or “affordable”) with a target opening by the end of 2017. 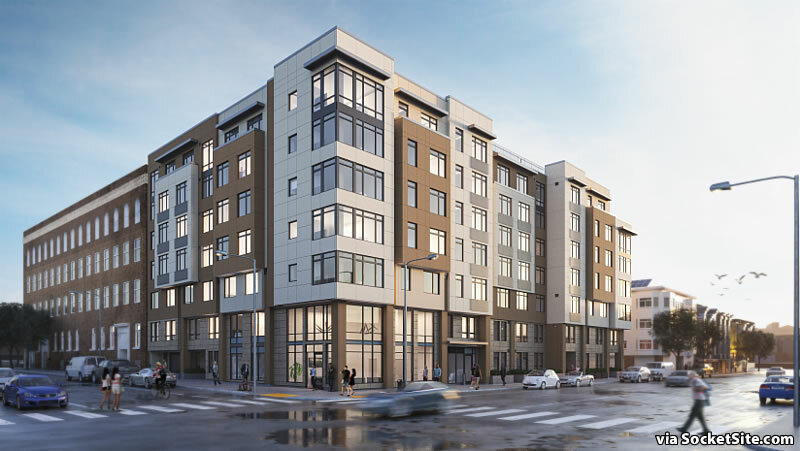 While the project has yet to break ground, the development has since been redesigned to fit 81 units within the same building envelope, by eliminating the previously approved 48-car garage and reducing the average size of the units. In addition, the development’s previously approved ground floor commercial space has been redesigned as a 680-square-foot community room and all full balconies have been eliminated from the plans. And with the building permits for the 81-unit development, which is being championed by Bridge Housing in conjunction with the Mission Housing Development Corporation, having recently been approved and issued, the Mayor’s Office of Housing is expected to authorize the San Francisco Housing Authority to submit a request to the United States Department of Housing and Urban Development to release funds for the development and certify its environmental review within the next three weeks, clearing the way for the project to finally break ground. And this afternoon, the ceremonial groundbreaking for the seven-story building to rise at 490 South Van Ness, as newly rendered below, will be held and the development should be ready for occupancy in late 2020 with 20 of the units having been set aside for households that will be relocating from HOPE SF projects and the remainder to be offered to families that earn up to 60 percent of the Area Median Income (AMI). Great news! Now let’s get the project at the 16th St Bart station moving forward! Great project. Happy to see it move forward. Great project for JCN Development who traded three condos worth $2.5mm at a market low in 2009 for this parcel and then sold it to the city for $18.5mm. Your tax dollars at work. I wonder what the final per-unit cost will be, starting with $256K per unit for dirt? From an 2009 posting, the land was originally listed at $4.5 million. There are some asset swapping those value probably not reflected in the 2.5M sales price. Plus it was 2009. Plus there are further upzoning. The city may not made a deal as bad as this number looks. That say, I wish there is some independent public redevelopment agency to proactively buy land when the market is low, rather than a government to buy land when the market is high to react to the constituents’ dissatisfaction. They added 9 units, or 12% more, to the original design. I say the delay is worth it. Nearby neighbors have been beyond patient waiting for the city to finally move on this development. 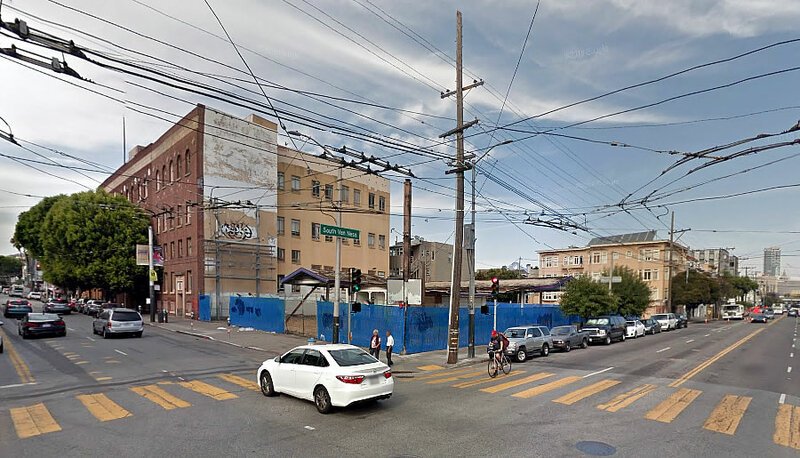 However, Mission Housing has done a very poor job of planning this, resulting in an increase in criminal activity on Adair Street, which adjacent to the lot. They removed the lighting that was placed there which helped deter illegal encampments and drug deals to name a few. The mission housing administration needs to step up and fulfill their commitments to nearby neighbors disrupted by the construction. I agree with David. I also live on Adair and have for 27 years. The conditions have been unhealthy and unsafe for many years. Twice the city owned lot was fined by another city agency for urban blight, demanding immediate cleanup. MHDC has not met any of their promises to us and think it’s ok for us to live under such conditions year after year. I’m all for below market housing. I work at City Human services who helps people are in lower socioeconomic demographics. MHDC is deplorable for not doing what was promised and their lack of communication with Adair residents is irresponsible at best. I heard from a little bird it’s budgeted to end up at $900k per unit. That lot/and corner will transform positively. Or as we first reported back in 2015, the projected cost for development was running around $888,889 per unit at the time. Christ, $900k/door for BMR and low income housing? Only the public sector would think that’s a good idea. The optimist in me agrees, great news, this approval will be amazing for the neighborhood. The jaded San Franciscan in me says that the windows on those corner units scream class and privilege. The double height ground floor also appears intimidating to local residents – they had best not paint it white as shown. And they had originally planned BALCONIES? Unbelievable this got approved. why are tall windows intimidating? whats wrong with white paint? why does an architectural feat like corner windows scream class & privilege? Whats wrong with some nice architectural design…Modern features and good use of space. Poor, middle class and rich alike all deserve good design. That’s because a link was removed. The comments are meant to be sarcastic. thanks parklife! yes, it was poorly executed sarcasm making light of the outrageous hypocrisy that is MEDA – they fight every market rate housing development tooth and nail for exactly those things, and file discretionary review after discretionary review to delay market rate projects, but nobody says a word about those exact things when it’s 100% affordable. What does the footprint of the building look like? I.e. where are the light wells, etc? How can the old building beside it be 4 stories, this new one 7 stories, but they have the same roof line – are the same height? The rendering is either skunked – or the new building has 6′ ceiling heights? I.e 4 stories * 10′ a story = 40′ for old building. 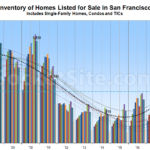 7 stories * 6′ a story = 42′ for new building…. The Redstone building is offices, so it has higher ceilings.